Perfect for all contact sports. The #7580 HexPadTM Thudd Short with Extended Thigh is a pro compression short with 5 HexPads™ that protect hips, tail bone and thighs. 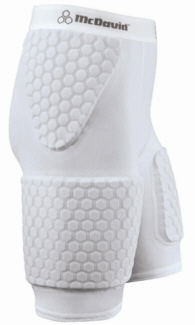 Pads extend to the sides for the thigh for added protection. HexPadsTM are patented lightweight, breathable, individual athletic pads conform to and stretch with your body for continuous protection. Perfect for all contact sports. 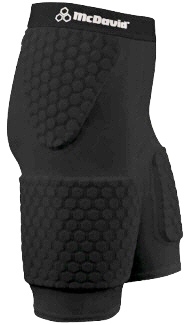 Compression fabric supports large muscle groups to reduce muscle pulls and fatigue. Moves with your body to prevent skin irritations, chafing, and abrasions. Ultra hDc™ Moisture Management Technology enhances heat control, comfort and performance. Colors Available: White, Grey, and Black.